An ongoing maintenance project is expected to limit parking and pedestrian access at the Oak Ridge Civic Center on Tuesday, December 11, 2018. 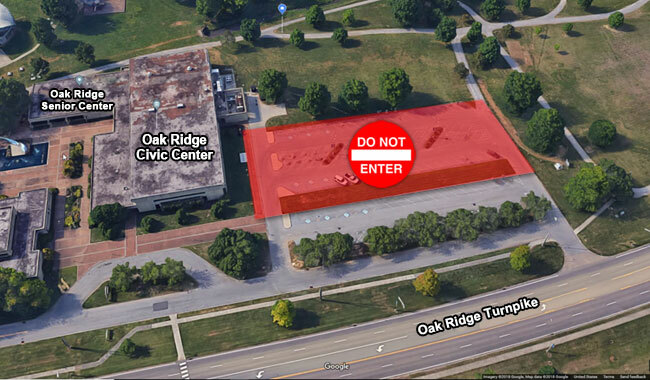 The City of Oak Ridge Public Works Department is advising residents and visitors that a majority of the parking lot west of the Civic Center’s recreation building will be blocked due to construction activity. The building is located at 1403 Oak Ridge Turnpike. Vehicles will still be able to utilize the entrances from Oak Ridge Turnpike and Oak Ridge Boys Way, but drivers will be blocked from entering the back section of the west parking lot. Sidewalks and entrance/exit doors on the west side of the building will also be inaccessible. Anyone planning to be in the area during the affected time is urged to use extreme care and follow all directional signage. We apologize for any inconvenience the limited parking may cause. All construction work is subject to change based on weather conditions and other unforeseen circumstances. Questions can be directed to the Public Works Department at (865) 425-1875 or the Recreation and Parks Department at (865) 425-3450.